Each year Celsia does a number of webinars and conference presentations on the use of heat pipes and vapor chambers. Here’s a collection of the most often asked questions, along with the responses. Some are broad while others are application specific. We hope you find it useful. Q1: Do you offer thermal design and prototyping in addition to mass production services? Yes, but generally only at the thermal module level as our customer base is equipped to handle PCB and system level thermal analysis. We have a very experienced crew of design and prototype engineers that often turn-around projects in less than 3 weeks, depending on the complexity of the design. We have a company owned mass production facility in Taiwan – for cost and quality reasons. Q2: I’ve never heard of a one-piece vapor chamber. What is it? Rather than using two stamped plates that are welded together, one-piece vapor chambers begin life as a very large tube which is flattened to between 1.5-4.0mm. The advantages are cost savings and the ability to bend it in the Z-direction – even forming a U-shape. While a growing number of manufactures offer the one-piece design, Celsia was the first to commercialize it in 2006 and holds a number of patents pertaining to their design. Q3: Do you have a datasheet showing specific power handling capabilities of two-phase devices? Both heat pipes and vapor chambers can be optimized to handle a wide array of application requirements. Optimizations include working against gravity, high-heat flux, and isothermalization. Bending and flattening will also effect performance. Because we customize the wall thickness, wick characteristics, and fluid loading for each application, it’s best to begin the process with our online calculators that can be found in the Resources section of the website. Q1: How do you model a heat pipe or a vapor chamber in CFD? Assign an effective thermal conductivity to the heat pipe or vapor chamber into the model. As these figures are highly application specific, we suggest using one of the Celsia online calulators or contacting us with rough design guidelines and we’ll calculate the appropriate figures for model input. To do this, we calculate the thermal resistance of the heat pipe or vapor chamber to get the delta-t in the device. Using the cross section and length of the device we then calculate the effective conductivity numbers. Q2: Is there a single effective thermal conductivity figure I can use during the early stages of CFD modeling? Depending on the design, effective thermal conductivity can range from 1,000-50,000 W/m-K, but we suggest using 5,000 W/m-K for the initial model (copper/water sintered wick heat pipe). More precise numbers can be derived from our online calculators or by contacting us through the ‘Request a Quote’ button at the top of this page. Q3: Can I just model phase change within my CFD application? While technically possible it does not add significantly to the accuracy of the model. For detailed modeling, the approach is to model the wall, wick and then assign a large effective conductivity number to the phase change. This approach does not truly model the phase change, For the vast majority of applications, it is equally effective to use a bulk conductivity assigned to the element in the model. Q1: Can I route heat pipes from various heat sources to a central condenser? Yes, this is done routinely in applications such as laptop PCs. A single vapor chamber and condenser solution can also be used to cool multiple heat sources. We’ve done applications where 6-8 ASICS have been cooled and kept to within 2 degrees Celsius of each other. Q2: How do I determine the area and length of the evaporator and condenser sections? The evaporator is fixed by the size of the heat input area and similarly the condensation takes place where the heat sink is located. Typical heat pipe and vapor chamber designs do not have specific evaporator and condenser areas. For heat pipe applications, you must ensure that the pipe(s) fully cover the heat source to avoid hot spots. For vapor chamber applications, where spreading the heat is important, a minimum ratio of 20:1 vapor chamber area to heat source area is recommended. 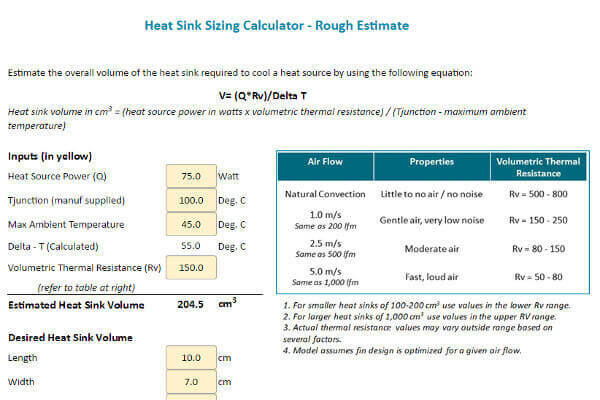 For quick estimates on heat sink size requirements, use our online heat sizing calculator. Q3: In a thermal cycling application, what is the transient response of 2-phase devices? The evaporation, vapor flow and condensation take place immediately as heat is applied. The time constant is due to the thermal capacitance of the system being heated or cooled. Q4: How can I make material & wick structure selection if the heat pipe is under jet engine vibration environment? Two types of wicks have been used for these applications, groove and sintered powder. Groove holds up well to shock and vibration because they are part of the wall. While sintered wicks are diffusion bonded to the wall. Mesh wicks would have a tendency to move due to the vibration unless it is also bonded to the wall. Q5: What environmental stresses can heat pipes survive? Temperature extremes: Operating and non-operating temperatures especially through freeze thaw cycles and high elevated temperatures. Q6: For cost reduction purposes, what are the parameters do I need to consider to change from a vapor chamber to a heat pipe solution? Two key points, potential hot spots in the device being cooled and the added conduction losses in a heat pipe system. Q7: Is there any min. or max. length limit for heat pipes? Because effective thermal conductivity increases with heat pipe length, you generally do not see them being used to move heat less than 50mm for most electronics cooling applications. Maximum length for these applications is really not technically limited, but rather usually constrained by the enclosure size. It rare that we see requirements for heat pipes to be longer than 500mm. In industrial applications, heat pipes have been routinely made up to 30’ in length. Q8: Which is more effective – ‘4 heat pipes’ or similar size ‘closed loop pulsating heat pipe with 4 pipes’ placed between same evaporator and condenser? Properly designed I would order these 1) vapor chamber, 2) heat pipe and 3) pulsating heat pipe. Q9: By how much will delta-t be improved by using vapor chambers with direct contact to heat source versus heat pipes with a mounting plate? Direct contact will improve performance by between 3-5 degrees Celsius. Q10: What is the allowable clamping pressure or range based on size of the vapor chamber? We typically allow for up to 60 psi clamping pressures, although some designs can support 90 psi. Q1: What are the most important parameters regarding the design of the wick structure? Power densities and operating orientations are the two driving factors for determining the best wick structure. Q2: Is there a minimum delta T between evaporator and condenser ends for the heat pipe to work? No, a specific delta-t is not required. Q3: How do you solder/seal the different layers of the vapor chamber? Is it a mechanical cold soldering process by pressure or an electrical soldering process? They can be sealed using a number of processes; welding or brazing are the two most common. Q4: What are the definitions of the wick limit and vapor limit for heat pipes and vapor chambers respectively? Wick Limit – also known as the capillary limit, it measures the effectiveness with which the working fluid inside the heat pipe can move from the condenser section back to the evaporator area. As mentioned earlier, changes to the wick structure and dramatically change the wick limit of a given diameter heat pipe. Vapor Limit – is related to the amount of vapor that can move down the interior open space in the device, referred to as the sonic limit. Q5: What is the best solder material and process to attach heat pipes or vapor chambers to an aluminum metal sheet? Nickel plate the aluminum and then use any solder that is appropriate for the application. Q6: Does soldering damage heat pipes and vapor chambers? No, provided the solder application is below 180 deg C. For vapor chambers, special fixtures must be designed to contain the positive internal pressures. Q7: Do vapor chambers allow bends in the XY plane? Two-piece vapor chambers can be stamped into almost any configuration along the XY plane. Narrow one piece VCs can be bent in the XY with the same bend radius guidelines as heat pipes. Larger one piece VCs cannot be bent in the XY direction. Q8: What is the advantage of nickel plating on copper fins? The most common reason for adding a layer of nickel on copper fins is for cosmetic reasons. The best reason to add nickel is mor corrosion resistance. Q9: What is a good rule of thumb for de-rating heat pipe Qmax for flattening, bending, orientation, etc? Flattening – The closest one can get to a rule of thumb is ‘larger diameter heat pipes can be flattened more – in terms of flattened thickness to original diameter – before the Qmax is affected. Let me explain. For terrestrial applications, the two limits which affect the Qmax of a given heat pipe are wick limit (also known as capillary limit) and vapor limit (which is a combination of the sonic/entrainment limits). Unless the wick is unusually thick, the round heat pipe will have excess vapor capacity, meaning that that the wick limit will determine Qmax. For smaller diameter heat pipes like 3mm, there’s only a small excess so flattening it to even 2mm will bring the vapor limit below the wick limit and reduce Qmax. However, in an 8mm heat pipe there’s a massive amount of excess vapor space, so you’d have to flatten it to around 3mm before Qmax would be affected. Orientation – See the chart below. It’s important to remember that heat pipes can be specifically designed to work against gravity. For instance, the performance of a standard 8mm heat pipe will drop significantly depending on orientation. However, by tweaking the internal structure, we can raise the performance when working against gravity, but it will be at the expense of Qmax when working with gravity. Please use the Heat Pipe Performance Calculator in the Resources section of the website to understand how orientation affects Qmax. Q10: How do you mount a heat pipe assembly and ensure the processor or ASIC solder joints are not impacted by the additional load? The vendor should recommend a maximum load for the ASIC and then design the mounting hardware to the specification. Care must be taken with all thermal solutions when mounting to apply the pressure evenly. Q11: If VC is ranged for 50-150W does it mean that it will not work (start up) with 15W? No, these are the typical maximum values based on against gravity capacity (50w) and the gravity aided position (150w). Q12: What type of thermal interface material is typically used between heat pipe/vapor chamber and device? What pressure is required for good thermal contact with vapor chamber? The most common are grease and phase change coated graphite pads. A good rule of thumb for interface pressures is greater than 20psi. The server guys with higher power densities use up to 50 or 60 psi while the laptop designers struggle to get more than 5 or 10 psi.